I took my friend to this hospital a few weeks ago. She had been feeling unwell for several days with viral symptoms. Ten hours, one saline drip, a stool and urine sample, a diagnosis of a bladder infection and $4000 US later, I took her home. Yes, $4000. Turns out it was not a bladder infection. Whatever it was remained undiagnosed (probably a viral infection) did not require the over night stay and could in no possible way been worth a fraction of the cost. This hospital also owns the clinic by the Pemex. 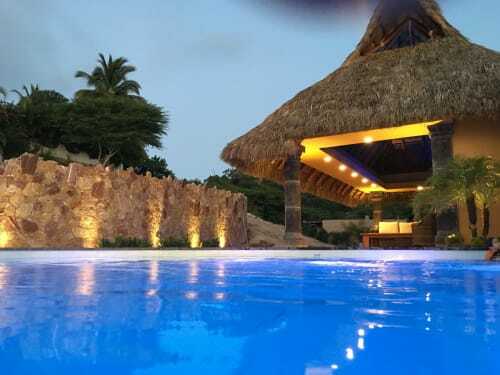 The company has also been reported from other parts of Mexico for overcharging. No matter how sick you are, it is worth driving less than a half hour south to the wonderful CMQ. Hospital in Bucerias. I rescued my dog Coco from Sayulita Animals in 2009. She was the most special dog. When she was diagnosed with kidney failure last year I was devastated. The love and care that Marcia gave to Coco was incredible. Marcia answered my WhatsApp messages on her personal phone number at all hours of the day, even when she wasn't working. She would come into the office to care for my dog on her days off. Coco loved being there and at the end she spent A LOT of time there. She had to get IV's for several hours towards the end. When I knew that her organs were about to shut down I knew it was time for her to go. I had her euthanized yesterday and it was so comforting to know how loved she was by Marcia and Gabriel. I highly recommend Animal Love to everyone. Dont go anywhere else for a car in PV. These guys are super straightforward with their pricing, and no more expensive than anyone else. After we confirmed our rental they sent all sorts of helpful info from driving to activities. They organized VIP shuttle from AirPort to get the car. When we got there, they we very friendly and super helpful. When we retuned the car, they dropped us off a a great restaurant for lunch before our flight, then later gave us a ride to the airport. Thanks Lalo! Cant wait to come back. Honestly, this was even better than we hoped. The house is lovely and clean, perfect indoor outdoor living. Felt very private, safe and protected, yet still very close to everything. 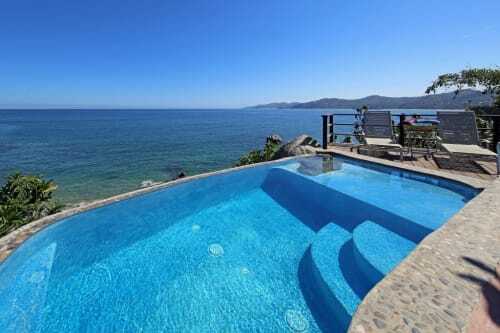 You can even see Playa Los Muertos and Sayulita beach from the deck (or paddle there). You could easily walk into town, but I highly recommend renting a golf cart (it just makes it all the more fun.) The 2 ocean kayaks are a great addition, even my 8 year old would paddle out easily and tool around the cove by herself. and OH the snorkeling! So good - we saw tons and tons of puffers, angel fish, rays, skates and more! We were very concerned about eating in town with the sickness issue, so we ended up having the lovely housekeeper Meche cook for us...five times! It was wonderful, plus the savings and leftovers, a no brainer! Better than Hawaii, for sure. Can't wait to come back to this exact house. 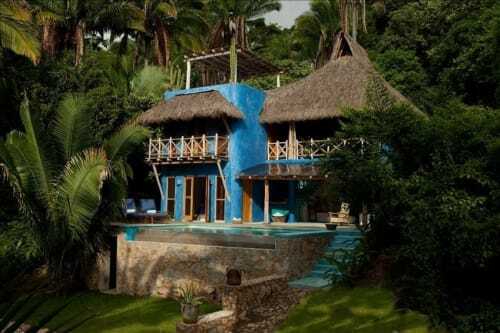 I cant imagine a better place to stay in Sayulita. 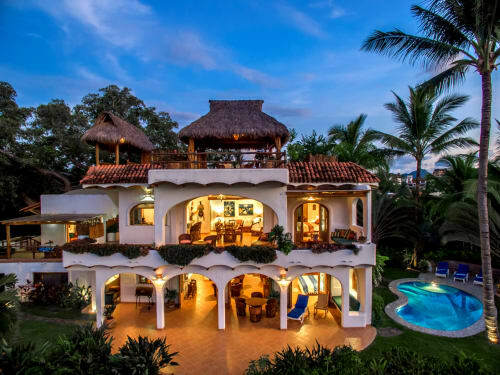 We fell in love with Sayulita, and are so happy we chose Villa Dorado. The location was perfect. It is in a gated little community that is right on the beach with a pool and security guard (even though we never felt unsafe). We walked 5 minutes to the heart of Sayulita each day to eat and shop, although there are also restaurants and an ice cream shot across the street. The beach is perfect, not crowded and we enjoyed the lounge chairs at the end of the property by the beach to watch the sunset each day. Incredible food, people and feel in this little beach/surf town. Eric and Ben were incredible. They helped us with our every need, even getting an iron ASAP for us because we were attending a wedding. The place was very clean and had maid service daily, extra clorox wipes in kitchen and bathroom, as well as the kitchen being fully stocked for us to make breakfast each day. The patio/kitchen space could not be cuter and more enjoyable to relax on and listen to the birds. I could say a million great things about why we loved renting at Villa Dorado. We were on the penthouse, but all 3 levels are darlingly decorated, clean and location is perfect. 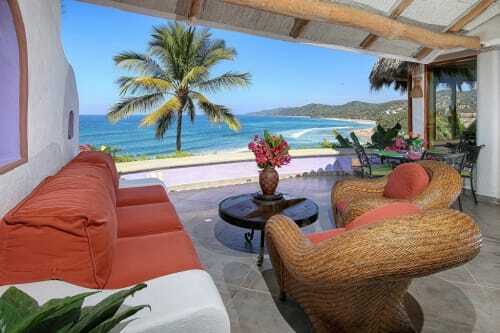 Rent here for the perfect Sayulita experience. You won't regret it! We spent two weeks in this Paradise! Not only wonderful accommodations, but Steve & Jackie were beyond accommodating! Any request was met with "Not a Problem". Couldn't ask for nicer hosts! !We had friends come down for the second week, staying in the unit next door, and the adjoining balcony was a very welcomed feature!All units have a "Comments" guestbook, signed by previous guests, that contains very helpful information on the town/ restaurants/beaches/ and many more tips to help you plan your stay.I would love to find something bad to say, just so it would be easier to book next time, but I guess we'll just have to plan our trip a little earlier to beat the rush.Muchas gracias por todo lo que haces, Steve y Jackie. ¡Te veremos pronto! This place is a gem. I almost hate to write about it because I wish it could be kept a secret... the pictures don't do it justice. My husband and I were looking for a quiet getaway for the week and this hit the spot! we arrived and walked through a lush garden to our casita (#4) which is incredibly private and has the most gorgeous views of the surrounding mountains and beach below. 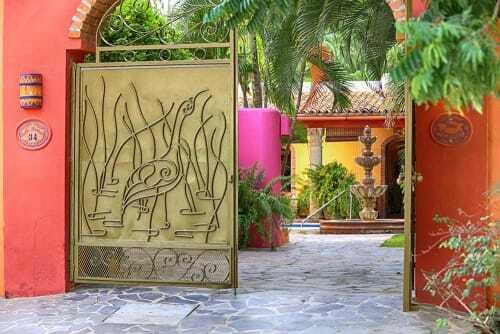 The casita itself was well appointed and thematically colorful and it had just the right amenities to make us feel incredibly at home. Everything about this place is great; its location, the views, the privacy, the small kitchenette, the cleanliness and charm. 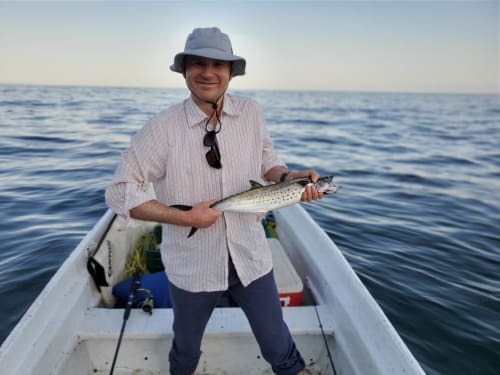 The staff was super attentive and accommodating and keep the property in great shape. Our interactions in booking and ideas with Katherine were smooth and very helpful. the 5.0 is well deserved and we hope we can come back one day and bring our family too! thank you!! !